It turns out that the next risk front facing business and promising to reshape the role of general counsel (GCs) is a piece of legislation notorious among lawyers for having no teeth and little direct liability for companies. The Modern Slavery Act came into force in the UK on 26 March 2015, consolidating existing legislation on slavery and forced labour. Yet beyond requiring companies to declare policies on stamping out slavery and human trafficking – and companies are allowed to say they have no policies – the legislation does not impose any direct legal liabilities on corporates. Despite this, the Act is viewed by many GCs and advisers tracking the area as symptomatic of how human rights have over the last 15 years become mainstream business considerations, increasingly blurring potentially devastating reputational risks with traditional legal liabilities. 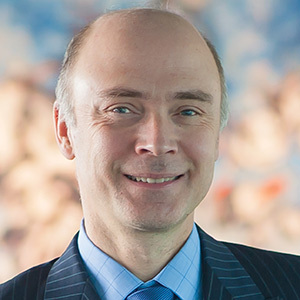 If the decades-long march towards tougher regulation, most evident in the crackdown on bribery and corruption, has transformed the role of company legal teams, human rights issues are to some lawyers the next stage of that evolution, pushing GCs into a wider range of matters well beyond traditional legal and regulatory considerations. 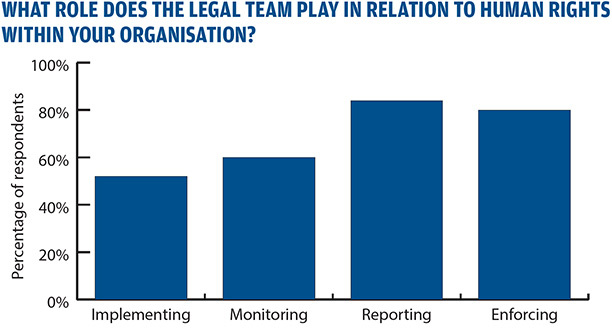 To address this rapidly emerging legal field, we teamed up with HSF for an Insight focused on the latest in-house and academic approaches to human rights in business, drawing on the views of a string of senior specialists in the area, as well as 275 senior in-house counsel responses to our survey. While non-binding frameworks such as the UNGPs are accelerating the trend toward quasi-legal accountability, they have also led to the introduction of a number of legal statutes, one of the most prominent of which to date has been the aforementioned 2015 UK Act. The Act has no power to compel disclosure (short of putatively obtaining a court order forcing companies to release a statement) and sets no formal requirements as to what a compliance statement should look like. 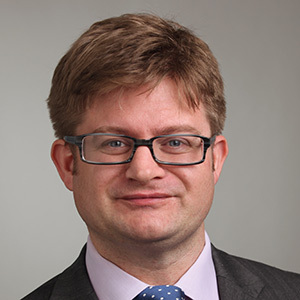 Nonetheless, argues HSF partner Daniel Hudson, this, like many mandatory reporting laws, creates a set of risks well beyond the legislative force of the Act itself. The legislation has been given fresh support in government by the elevation in July of former Home Secretary Theresa May to prime minister. May, who had overseen the law's passing at the Home Office, announced the creation of a new UK cabinet taskforce on modern slavery on 31 July, also allocating £33m from the aid budget to back initiatives overseas. The Home Office estimates there are 10,000 to 13,000 victims of modern slavery in the UK, against a projected 45 million globally. The theory is that by publicly stating its operations abide by a set of standards a company can create a duty of care and expectations from external stakeholders and introduce legal exposure to claimants in instances where human rights standards are not met (in the expanding corporate argot of human rights, such exaggerated claims are dubbed 'bluewashing'). There have been lawsuits brought against companies for not adhering to their own non-financial disclosure statements, typically resulting from problems encountered in remote parts of the supply chain, though the evidence for widespread litigation risk remains weak. 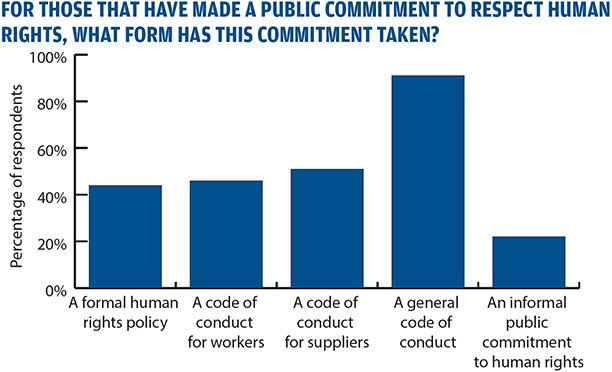 Anyone doubting the rapid spread of such issues for GCs only has to glance at some headline findings of our survey, drawn from the responses of 275 senior in-house counsel across a range of industry sectors. 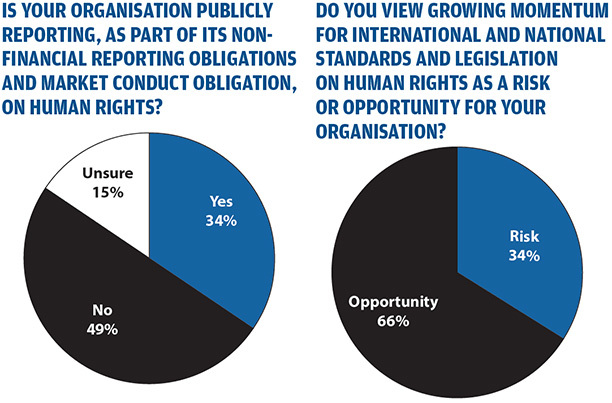 Nearly half of respondents' organisations (46%) have made public commitments to respecting human rights. Where such human rights commitments have been made they most commonly refer to either national laws or the UN guiding principles. Given the avalanche of publicity that greeted the Bribery Act, it is striking how little attention has been paid to an issue that is already demonstrably reshaping business practice. 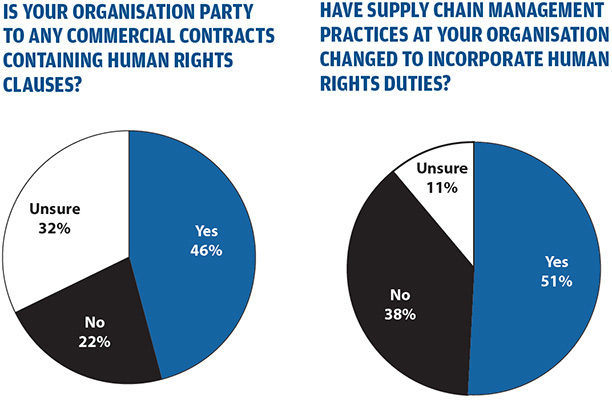 Fifty-one percent of in-house counsel report changes to their supply chain management to support human rights, while 46% have already encountered human rights clauses in commercial contracts. 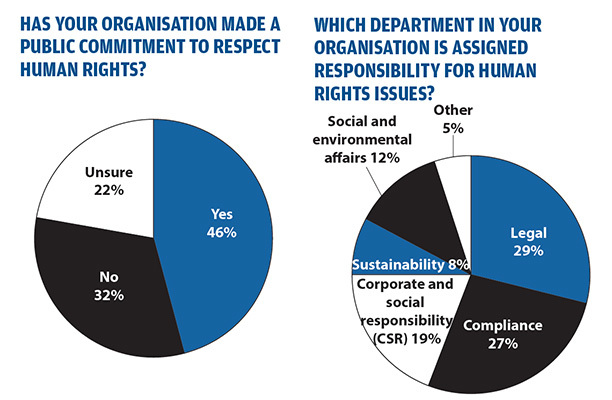 Legal teams are currently the most commonly assigned to take overall responsibility for human rights issues, cited by 29%, against 27% for compliance and 19% for corporate social responsibility (CSR) teams. In July 2015, just after scandal-plagued Sepp Blatter resigned as FIFA president, the sports body announced it would be compulsory for commercial partners and members of its supply chain to comply with the UNGPs. Given the global reach of football, this offers a prominent example of how human rights issues are likely to be introduced to a wider legal audience. 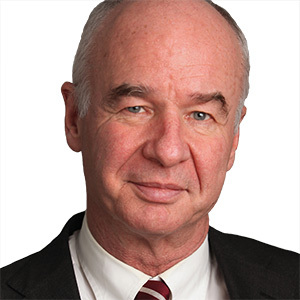 This, says John Sherman, GC and senior adviser to think tank The Shift Project and senior fellow at Harvard's Kennedy School, is evidence that the entry of human rights into contracts has the potential to challenge mainstream legal assumptions more quickly than changes in legislation. As far back as the early modern period of history, when the East India Company controversially wielded huge power, corporates have been involved in prominent human rights abuses. However, attempts to shape business behaviour in line with universal norms took on a new significance in the 1970s as the United Nations and the Organisation for Economic Co-operation and Development tried to develop codes to direct companies operating in multiple jurisdictions. Since that time, pressure for business to respect human rights has come in many forms: changing societal expectations on corporate behaviour, a growing trend toward transparency, and increasingly sophisticated tactics of non-governmental organisations (NGOs) seeking to hold companies to account. 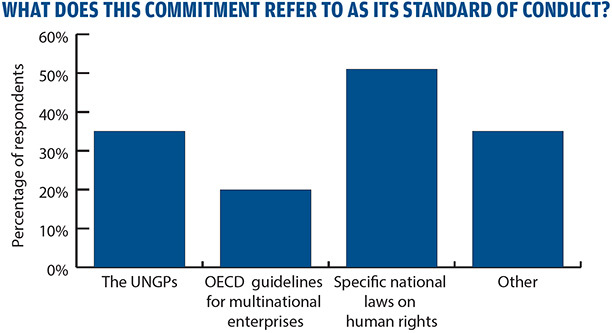 However, in promoting the issue to businesses themselves the watershed came in 2011 with the United Nations Human Rights Council’s endorsement of the Guiding Principles on Business and Human Rights (UNGPs), a document consolidating earlier thinking about universal standards and adding the official imprimatur of the UN. 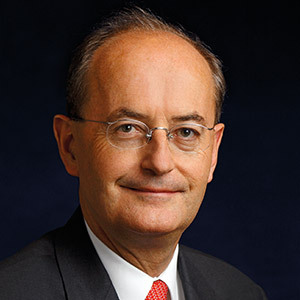 Drafted under the guidance of the UN Secretary-General’s Special Representative for Business and Human Rights (and Harvard professor) John Ruggie, the UNGPs are a series of 31 principles based around three ‘pillars’ calling on states and businesses to protect, respect and remedy human rights abuses. The UNGPs emphasise the primary duty of states to protect ‘internationally recognised human rights’, set out in a handful of international treaties with near-universal ratification. While not legally binding, the UNGPs set an expectation that businesses will respect the human rights protected in these treaties. Soft law instruments like the UNGPs have set in train a global shift from voluntary to mandatory standards, leading to an increasing number of governments implementing the principles as part of their national action plans and progressively introducing new legislation in this area. Further, the movement toward establishing a global treaty based on the UNGPs is currently underway, with the first session of the intergovernmental working group on business and human rights taking place last year. Sherman, one of John Ruggie's advisers during the drafting of the UNGPs, argues that this new lex mercatoria (law of merchants) is the most likely way in which human rights will cross into mainstream legal thinking. As wrenching as this shift in mindset is for lawyers, our research suggests it is a challenge the GC community in the main want to address. 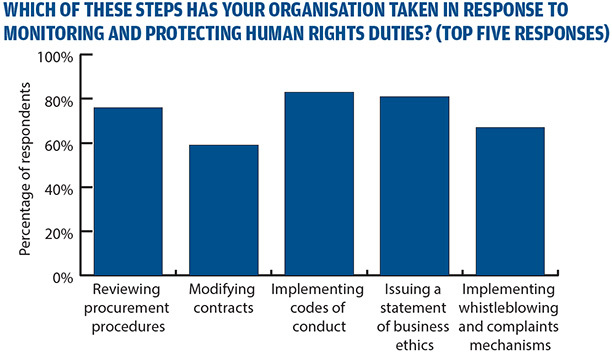 Asked how they view the global momentum in human rights standards, 34% saw it as a risk. The proportion that saw it as an opportunity? Sixty-six percent.